Thanksgiving is over, your refrigerator is still filled with leftovers, and you feel like you need something healthy, but you can’t quite let go of the comfort food. Well, this is the answer to all your problems. This deliciously healthy, yet satisfying, shepherds pie is filled with vegetables and lentils, and topping with your leftover mashed potatoes. If you don’t happen to have any leftovers I am giving you a suggestion on how to make new ones. This is a versatile recipe where you can throw in whatever vegetables sound good, or that you have hanging around. You could even through in that leftover green bean casserole if you so desire. Place cubed potatoes in a large pot, cover with cold water, and bring to a boil. Boil potatoes over medium heat until tender, about 10 minutes. While potatoes are cooking heat oil in a large oven-proof skillet (I use a cast iron pan). Saute onions for about 2 minutes, then add mushroom and cook until just softened, about 2 more minutes. Stir in diced tomatoes, tomato paste, paprika, garlic powder, salt, pepper, worchestershire, dijon, and lentils. Warm through, turn off heat and set aside. Drain your cooked potatoes, return them to the pan and mash them with the buttery spread, coconut milk, nutritional yeast, and 1/2 tsp of salt. 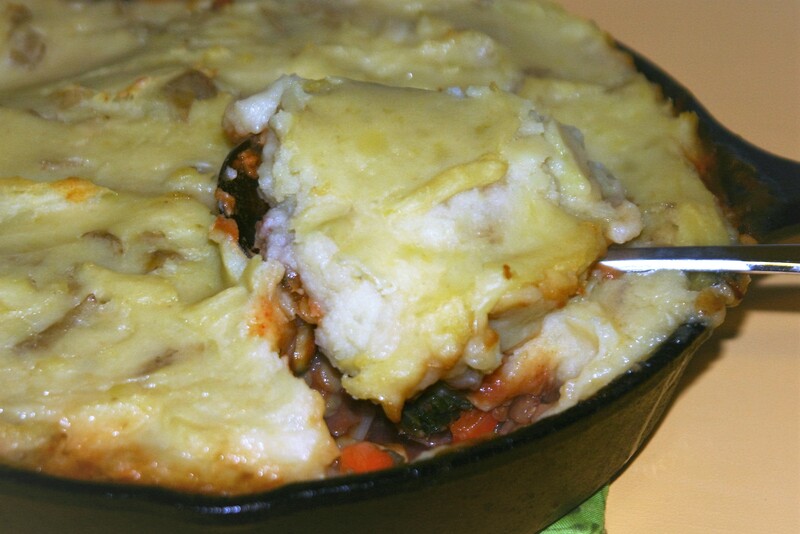 Spoon the mashed potatoes on top of the lentil/vegetable mix in the skillet forming an even layer. If you want you can cover you sepherds pie at this point and refrigerate until you are ready to bake it, up to 2 days, or immediately proceed to the next step. Bake in a preheated 375 oven until the top is golden brown, about 20-30 minutes.